Bob Leonard, Past Provincial Grand Junior Warden, celebrated his golden jubilee with the brethren and guests at Norcliffe Lodge No 7371. Assistant Provincial Grand Master David Randerson, together with North Fylde Group Chairman Peter Greathead, Harry Cox, Brian Parkin and Duncan Smith were supported by John Pitches Provincial Grand Steward and kept in order by Jason Dell Provincial Deputy Grand Director of Ceremonies. David Randerson (left) congratulates Bob Leonard. The master of the lodge Neil Kirkpatrick opened the lodge and made sure that the customary administration was swiftly dealt with. He welcomed David Randerson and formally offered him the gavel of the lodge, which on this occasion, David retained for the purpose of Bob Leonard’s 50th presentation. David then requested Jason Dell to place the celebrant in a comfortable chair before him. David started his presentation by setting the scene of the year. 50 years ago, in 1969 Harold Wilson was Prime Minister, the first test flight of Concord took place and it was the year that many remember for the moon landing where Neil Armstrong took ‘one small step for man and one giant leap for mankind’. Richard Nixon was sworn in as 37th President of the United States, Rupert Murdoch purchased the News of the World and Robin Knox Johnson sailed single handed around the world. In the charts Elvis sung about the Ghetto and Suspicious Minds and on TV, Monty Python’s Flying Circus had its first airing on television. “Not to get too far ahead,” David continued, because he observed that the story started back in 1931, when Ramsay MacDonald was Prime Minister and George V was on the throne. Al Capone was convicted of tax fraud, Arsenal won the First Division, Lancashire regained the County Cricket Championship, a loaf of bread cost 7 old pennies (that reference will become clearer later), John Le Carre, Les Dawson and Diana Dors were born and so was a certain Robert (Bob) Leonard. Bob, David said, started in hard and humble beginnings in Gorton, Manchester, as the youngest of 10 children to John and Eleanor Leonard. Bob’s first school was at Peacock Street and then he moved to go to Whitworth Street School; later to become the old Manchester Grammar School. With his mum’s support Bob worked hard even studying Latin to gain his School Certificate at 16. Bob enjoyed his sport, football, cricket and rugby playing for the school’s first teams. Bob’s first position was as a trainee manager at Lewis’s in Manchester. He spent two years there before being called up for National Service on his 18th birthday, being dispatched to Yatesbury in Wiltshire to train as an RAF radar mechanic. From there he transferred to RAF Valley to continue his work on fast developing radar. After his national service ended, Bob returned to Lewis’s where he met his wife Helen. From Lewis’s he moved to Tip-Top Bakery as a delivery driver. After Helen’s father passed away the pair moved to Blackpool to look after her mother and he transferred to Mother’s Pride Bakery. Bob moved on from a delivery driver, becoming a supervisor and shop steward before moving into management and then taking over as Area Manager. Eventually he moved to Norcross to work in the printing section. Bob and Helen’s family life has been filled with joy and sadness as they had five children, Paul Robert, Anita, David, Mark and Helen Elizabeth, seven grandchildren and eight great grandchildren. Bob gave great love and dedication to his wife Helen during all of her illnesses, caring for her at home for the last 18 months of her life. David then moved on to Bob’s Masonic life. It was his milkman, a Yorkshire man by the name of Raymond Davey, who asked Bob about becoming a Mason. He invited Bob and Helen to a ladies’ evening to get to know some of the people involved and Bob finally agreed to join, with Jack Smith as his seconder. His initiation took place at the Imperial Hotel on 10 February 1969. 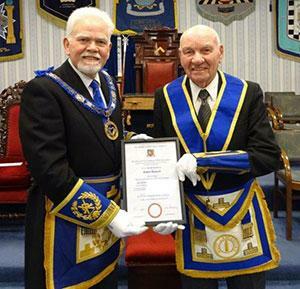 Bob progressed through all the lodge offices and in 1978 he became WM. At Bob and Helen’s ladies evening there were 240 guests. Following Bob’s year in the chair he served the lodge in several positions, including chaplain and almoner for many years, which he thoroughly enjoyed, treasurer and ADC. Bob had two brothers-in-law in the Craft; Terry Smith and Jack Hollows and not long after a certain Peter Greathead came in too, all of them becoming good friends. Bob joined both the Royal Arch and the Mark Mason degree but the pressure of work and looking after Helen forced him to resign from both. For the same reasons when he was asked to become group secretary he had to decline. Bob found that his increasing deafness also made it difficult for him and he also had to step down from Senatores Lodge of Installed Masters No 8966. David mentioned that despite her ill-health, Helen always insisted that Bob continued to go to the lodge. Throughout all those years Bob always tried to put something back in and he never forgot the support he received from the brethren of Norcliffe Lodge. He enjoyed performing the ritual in many ceremonies and he will be doing a second degree ceremony for a candidate in the near future. The young Masons are Bob’s passion. indeed Bob has never missed a junior practice. He continues to encourage and support and take great delight and pride in seeing the younger Masons develop and progress through the chair. Lodge social events are popular for bringing in potential candidates and even at the tender age of 87 Bob is always looking to the future. All the many years of service to the lodge and the Craft, his contributions were first recognised in 1989 by his first appointment in Provincial Grand Lodge to the rank of PPrJGD and then in 1996 Bob was further rewarded by promotion the high rank which he now holds of PPrJGW. Pictured from left to right, are: John Pitches, Brian Parkin, Peter Greathead, David Randerson, Bob Leonard, Neil Kirkpatrick, Harry Cox, Duncan Smith and Jason Dell.